Based at Vadodara (Gujarat, India), We are involved in Injection Molding services. We manufacture Injection Molded Components, Compression Molded Components, Insert Molded Components, Assemblies, Molds with superior technology quality Plastic Parts. We also provide Plastic injection molding job work with best quality services. We are providing Custom Plastic Molding Service our team of experts checks the entire array on various parameters. Apart from this, we provide our entire range in different specifications, in order to meet varied needs of clients. Furthermore, these products are highly acknowledged for their brilliant features among our clients. We offer customized molding service for plastic products for automotive, home appliances, furniture and engineering hardware industries. Our products meet customer quality and accuracy requirements and are cost effective. We are one of the prominent manufacturers on contractual basis of plastic products which are made from the premium quality raw material. 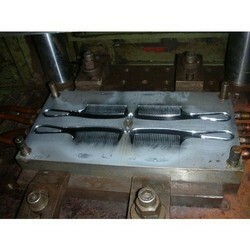 We are highly acknowledged organization engaged in providing Plastic Molding Service.